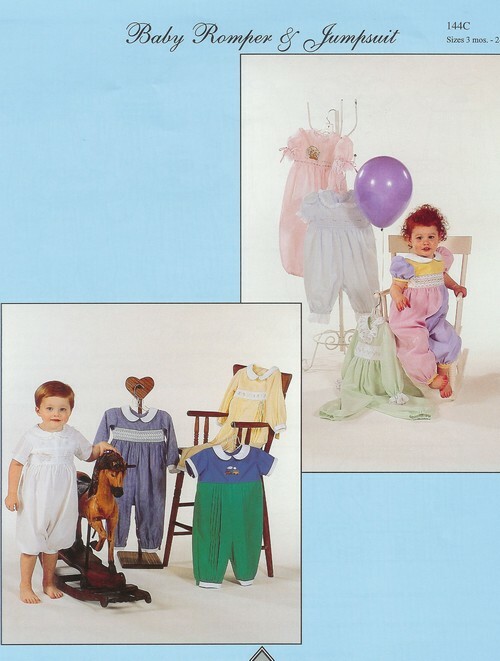 Baby Romper & Jumpsuit can be sewn for boy or girl. The short version goes to below the knee & the long version goes to the ankle. The romper can be smocked, appliqued, shadow work embroidery, heirloom sewn. Bottom of the romper can be gathered to the bodice or pleated. There are 5 sleeve variations and 6 neckline/collar variations. Bottoms can be cuffed, gathered w/elastic or ruffled.